Nemetschek’s Vectorworks software has been one of the most powerful and popular CAD (computer-aided design) programs for the Mac for a couple of decades (the product started out as MiniCad in the late 1980s). Vectorworks 2009’s integrated 2-D drafting and 3-D modeling capabilities serve multiple CAD specialties with six versions of the software: Vectorworks Architect (architecture); Vectorworks Landmark (landscape architecture and planning); Vectorworks Spotlight (set design and theater, event, and exhibition planning); Vectorworks Machine Design (mechanical engineering); and Vectorworks Fundamentals (2-D drafting, basic 3-D modeling) make up the five distinct modules. Vectorworks Designer, the sixth module, combines the other five into one comprehensive package. RenderWorks, a high-end 3-D rendering engine, can be integrated into any of the modules. Vectorworks has evolved over the years from a lean and mean drafting application with a quick learning curve and inexpensive price to a very powerful high-end CAD application with more features to compete with the top CAD programs on any platform. The price for this competitive edge is that the interface is now much more difficult to master, with complex palettes, layered menus, and hidden features. The cost has also crept into the $2K range, depending on the module you get. Still, this is less than half the cost of other CAD products, most of which are available only for Windows. The big news for Vectorworks 2009 is a new 3-D modeling engine that controls how your model is created, calculated, altered, and displayed. Nemetschek has replaced the program’s previous kernel with the Parasolid 3-D modeling kernel built by Siemens PLM, considered by many professionals to be the leading CAD/CAM/CAE engine. This industrial strength modeler significantly boosts the power and performance of the program and allows Vectorworks 2009 to handle larger and more complex modeling projects. Nemetschek says this new engine operates roughly four to five times faster than the previous version for most 3-D operations and up to twelve times faster for Boolean operations (adding and subtracting 3-D shapes and surfaces). While I cannot confirm the exact speed increase, the modeling certainly feels significantly faster. Vectorworks is a cross-platform application that also runs on the Windows operating system. In the PC market, Vectorworks competes with CAD powerhouses such as Autodesk’s AutoCAD/Revit and Bentley’s Microstation. The new Parasolid modeling kernel now puts Vectorworks 2009 on a more equal footing with both of these bellwether products. This bodes well for Vectorworks’ future, and the Mac community benefits from this competition. The buzz in the 3-D software world these days is Building Information Management (BIM). BIM is the concept that all building information can be combined into a single data set and model that can be managed through the life cycle of that building, from conception through construction and on through occupation and maintenance. BIM is a process that goes far beyond switching to a new software package. It requires changes to the workflow of the traditional architectural practice and more data sharing than most architects, engineers, and builders are currently used to. Vectorworks 2009’s new Snap Loupe feature zooms in as you perform detail operations. To date, BIM is making its greatest impact in large architectural firms working on very large projects and government buildings, and there is still much debate regarding when and if the concept will affect a significant number of medium and small-sized firms. So, while I think this has much more to do with the future than what is practical for most designers today, Nemetschek is methodically positioning Vectorworks with an eye to the BIM concept. New capabilities of the Parasolid engine, such as the increased accuracy and the additional performance of more complex models containing even more information about the objects in the model, allow Vectorworks to take an important step in that direction, even if they are only partially leveraged in Vectorworks 2009. I expect additional dramatic changes in future releases due to the new kernel. Not all of the changes Nemetschek added in Vectorworks 2009 are under the hood. While it is important to note the new 3-D modeling engine, the basic interface and workflow for Vectorworks 2009 are mostly unchanged from what is already familiar to current users. However, there are many very useful updates and tool changes that will benefit users, even if they don’t use 3-D modeling extensively. Below are a few that I find noteworthy and which, for the most part, apply to most of the different modules. A Smart Cursor gives you visual and data feedback on screen at the location of your mouse as you move over your drawing, make selections, and draw objects. 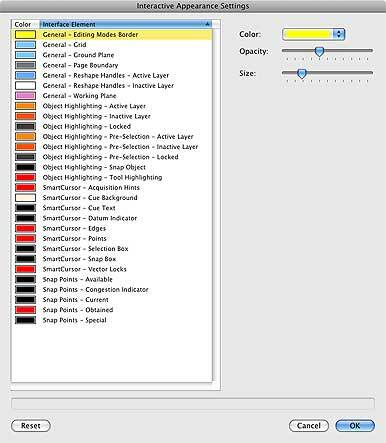 Vectorworks 2009 has several improvements to an already good Smart Cursor system. The most visible are Pre-selection Indicators. Objects are highlighted as the mouse passes over them, giving you visual feedback about which object would be selected if you click. Objects can now be highlighted in different colors, depending on whether they are on the active layer or other layers. This makes object selection on complex drawings much easier and faster. In the Interactive Appearance Settings dialog, all of the smart cursor elements can have their own color, opacity, and size adjusted. There is also new visual feedback on all potential snapping points. Snapping points are specific spots on objects, such as corners and center points; if you grab the object near one of these spots, the point on the object will snap to your cursor, allowing you to more precisely move or place that object. With Vectorworks 2009, the additional visual feedback makes it easier to know when your cursor is near one of these points. This improvement is particularly welcome for mid-points and other points along lines and edges of objects (corresponding to your current snap preferences), and I love the fact that I can now find these same points in the spaces between objects. All of this visual feedback is fully customizable via the Interactive Appearance Settings dialog, where users can adjust all of the Smart Cursor elements, such as color, opacity, and size. There are 29 adjustable elements, and while their management might be a bit overwhelming for new users, designers who spend hours a day in Vectorworks will appreciate how such customization saves time and enhances the user experience day to day. I highly recommend that current users take the time to adjust their snap settings. The default settings create a different feel than in Vectorworks 2008, and this can be frustrating at first, causing you to think that you've selected an object at a certain snap point only to find, once the object is placed, that you did not. Using the new Snap Loupe feature can also help. One of the coolest new features in Vectorworks 2009 is the Snap Loupe. This works like a jewelers loupe to let you temporarily zoom into a precision operation, such as selecting an object at a very specific snap point or snapping that object to another specific point in a complex drawing. The snap loupe can be activated with a shortcut (the Z key) while you are moving your cursor or an object over the drawing. The zoomed portion of the drawing appears in a floating window and automatically goes away once you click your selection. I found that the Snap Loupe worked most of the time, but had some trouble with it when working with some overlapping objects and symbols. Nemetschek is aware of this intermittent problem and is working on an update. Vectorworks has allowed the import and export of PDF files for some time. In last year’s update, they enhanced the export to PDF function allowing greater control over PDF options resulting in smaller files and better, automatic file naming. 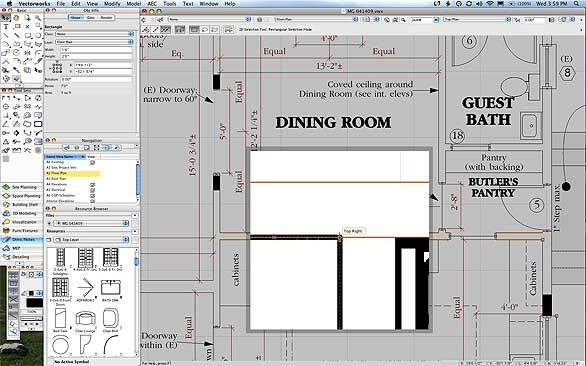 New in Vectorworks 2009 is the ability to snap to objects within an imported PDF file. Objects can be text, lines, or graphics. This makes it much easier to incorporate PDFs from the Web or from other team members into your presentation drawings. The Symmetric by Distance setting in the Scale Objects tool makes scaling PDF drawings more accurate. I tried snapping to various PDF files created in Excel, Word, Photoshop, and Vectorworks itself. Most of the objects in these documents ended up being snappable; the exception was a scanned photograph, which I did not expect to have any snap points. A new 3-D feature allows you to place 3-D objects such as doors and windows in walls more accurately the first time. You can use two reference points and an offset distance to set the position prior to inserting the object into a wall. You can also use an offset distance when moving objects and symbols already placed in walls. Lastly, there is a new Duplicate Array tool for objects in walls, allowing for equally spaced objects to be duplicated along a wall object. Other improvements included in Vectorworks 2009 may be small, but they contribute daily to users’ efficiency. The Eyedropper Tool lets you control drawing visibility by turning an entire class or layer off just by clicking on a single object in that layer or class. This can save hours of work, especially when dealing with imported AutoCAD files that often appear with dozens or hundreds of classes or layers. The Revision Cloud object, used to draw and outline around changes in drawings, has new features that give you more control over billow effects such as size, height, and variability. A new shortcut switches the focus from the drawing to the Object Info palette. Users will often want to edit the properties of an object immediately after drawing it, and this little addition will likely be used a lot, saving hours over time. The new Polyline mode allows you to draw polylines from a series of tangent arcs. This is a common practice in landscape design and is a welcome addition. The import and export capabilities of Vectorworks 2009 have been updated to include the latest AutoCAD 2009 DWG formats, essential when collaborating with engineers and other professionals who may not be using Vectorworks. There is also a new feature that allows you to import files with drag and drop. This works with the following file formats: 3DS (.3ds), DXF/DWG (.dxf, .dwg), EPSF (.eps), IFC (.ifc, .ifcxml), IGES (.igs), image files (various file extensions), Metafile (.emf, Windows only), Parasolid (.x_t), PDF (.pdf), PICT (.pct, .pict), SAT (.sat), Shapefile (.shp), and SketchUp (.skp). If you’re in a profession targeted by one of Vectorworks’ specific modules—Architect, Spotlight, Landmark, or Machine Design—you'll find Vectorworks 2009 to be a world-class CAD program at a price that, while expensive, still provides a great value, especially when compared to alternatives. Designer + Renderworks includes all of these modules and, if it fits your budget, is the best way to go. If you're mainly interested in 2-D drafting and basic 3-D modeling, or if you are on a tighter budget, Vectorworks 2009 Fundamentals is the best value. In any case, for new users, I recommend taking advantage of the free training videos on the Nemetschek Web site, as well as the Training Guides and Training DVDs available for purchase ($50 to $100, typically).